So, Pantomime… Where can I start? For one, its amazing, if there’s ever a book that you need to rush out and pre-order this is it. I was captivated from the very start and didn’t want to give it up when it was over! There something hidden in the pages that may shock any reader. A secret that needs to be uncovered and the only way you can uncover it is if you read it, because I’m not going to share it, but its a good un! The story follows Micah and Gene in their tales; tales of unhappiness and tales of secrets. 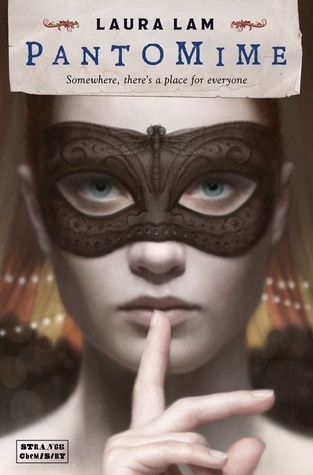 They each have things to hide and their stories interlock really well and I loved it. I was more a fan of Micah’s story that Gene’s but I can see that theres a definite benefit to knowing Gene’s too. Gene is a rich girl, a noble girl, who’s family is putting a lot of pressure on her. She prefers activities that her mother does not see fit for a young woman and shuns. The only person she feels truly loved by and comfortable around is her brother Cyril, and even then there are problems. Micah is a runaway, he joins the circus because he is enamoured by its beauty and magic. I feel for him because theres nowhere else he can go. The two do cross paths in a way and it makes for a brilliant story. The writing is just amazing, I almost want to use the word perfect but I fear the backlash of that word as I know that nothing can ever be perfect in everybody’s eyes. I found it perfect, there you go… It’s captivating and magical and I had no problems at all imagining Sicion and the surrounding areas, the Penglass and the weird and wonderful people of the circus. I really did see it all in my minds eye and I couldn’t get over how fascinating it was. The characters really made the book for me and I oved the connection I felt to each and every one of them. Cyril was a loving, kind brother to Gene and Oswin was such a great match for her, so much so that I begged for them to get together, maybe later in the series – for I am sure this must be the first in a series – Gene herself was strong minded and knew what she wanted, but due to the restrictions put upon her knew that what she wanted would be hard to achieve. Micah was an amazing character, again strong willed but struggling and finding a home in the circus meant a lot to him. Other characters within the circus were just brilliant and each had their own back story. Aenea was such a sweet, beautiful sounding character and I loved her for the love and warmth she gave to Micah. Drystan was much like the other characters at first but he really grew on me as a reader, especially when you find out a little more abut him, and I ended up loving him. I really would recommend Pantomime, its full of magic and mayhem and little titbits that I love to see in books, like inserts from other ‘texts’ based in the world its set in and things like that. They really added to the story and I loved it all the more for them. Pantomime is quite possibly one of the best fantasies of its type I have read this year and I cant wait for more – please tell me it is a series Strange Chemistry! Pantomime will be released in the UK on February 7th by Strange Chemistry, My copy was sent by the publisher in exchange for an honest review. This sounds fantastic! I’ll definitely have tog et my hands on a copy. I keep hearing only amazing things about this! I loved your review I really need to get me a copy of this one. Great review – sounds like a fantastic book! This one sounds rather fantastic and intriguing – can’t wait to get hold of a copy!